Niagara Falls will turn green for the first time to mark the Ireland’s National Day. 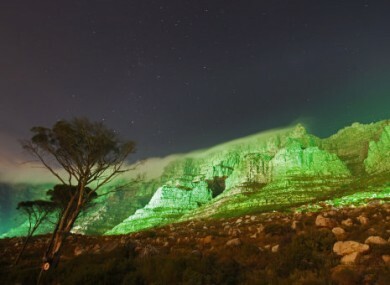 Table Mountain turned green on St Patrick's Day 2011 in South Africa. NIAGARA FALLS WILL flow green on 17 March this year as the attraction celebrates St Patrick’s Day for the first time. Among the other landmarks going green to mark Ireland’s National Day are the London Eye, Dubai’s Burj Al Arab, Table Mountain in Cape Town, the Empire State Building in New York, Berlin’s TV tower at Alexanderplatz and the Sky Tower, Auckland. The powerful waterfalls will light up green on both the US and Canadian sides as part of the ’go green’ promotion which kicks off Tourism Ireland’s drive to grow overseas tourism to Ireland. “Over 70 million people around the world claim links with the island of Ireland and St Patrick’s Day is a truly unique opportunity to reconnect them with their heritage and to showcase our wonderful tourism offering to a huge global audience,” said Niall Gibbons, chief executive of Tourism Ireland. He added that the heightened profile of the holiday allows for the ambitious ‘greening’ initiative. Our aim is to bring a smile to the world and to convey the message that Ireland continues to offer a warm welcome, fun and spontaneity, alongside fantastic scenery and cultural activities. The Chicago and San Antonio Rivers and the White House fountains will also ‘go green’. Back in Europe, the Dusseldorf Lighthouse and five skyscrapers in central Stockholm will celebrate the day. The sporting world will also participate in the project. Ireland’s rugby team takes on England in Twickenham on 17 March in the Six Nations and Tourism Ireland is to capitalise on the millions of TV viewers by taking prominent sideline advertising. At Cheltenham, 15 March has been labelled St Patrick’s Thursday as the horse-racing festival is not running through to 17 March, which is usually recognised by punters. Tourism Ireland’s first half campaign is focused primarily on the top four source markets – Great Britain, North America, France and Germany - which together deliver about three-quarters of overseas visitors. Last year, about 7.4 million overseas visitors came to the island of Ireland, delivering revenue of about €3.4 billion. Email “Going, going... green: World landmarks to celebrate St Patrick's Day”. Feedback on “Going, going... green: World landmarks to celebrate St Patrick's Day”.